Seth Ausubel is one of the best birders in Queens, New York, and Corey is ever-so-thankful that Seth does not use eBird because that way Corey can pretend that he is the top lister in the borough. Seth is generous with his knowledge, and, knowing this, Corey cajoled him into providing this post about one of the many avian mysteries of New York City. All text and photos in this post are copyrighted and used with permission. Enjoy! One of the least known stories of New York birding is the tale of the wild Mitred Parakeets. While many birders are familiar with the local Monk Parakeets whose large stick nests are found throughout the metropolitan area, the Mitred Parakeets are largely a mystery. 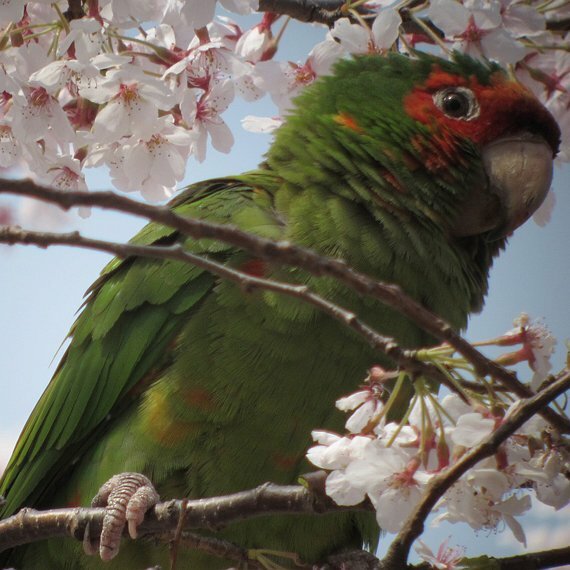 But in fact they have been with us for more than 25 years, and each spring for the past decade or more, like clockwork, they show up on one block in Hillcrest, Queens to feed on the blossoms of two ornamental cherry trees. I have been observing them there and at few other lucky locations for the past few years. What, you may ask? 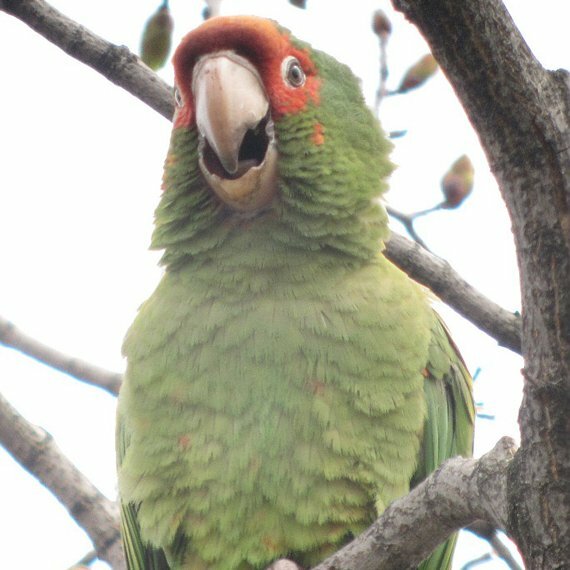 There is a population of large green and red parrots in New York City? How did they get there? How do they survive the winter? How many are there? Are they breeding? Are they “countable”? I investigated these questions and I have some, but certainly not all the answers. Mitred Parakeets have been seen in New York since at least 1984, mostly in southwestern Nassau County and Queens. Mitred Parakeets are popular pets, commonly known as Mitred Conures. During the 1980s, over 140,000 were imported to the U.S. from South America. JFK Airport was a major hub for the importation of wildlife for the pet trade, and it is likely that birds escaped from quarantine during this period. The population may also be supplemented by releases of pet birds. Miami and Los Angeles were also major importation hubs, and populations of Aratinga mitrata are well established in those areas. Mitred Parakeets are native to southwestern South America. They are a temperate zone species, found at high elevations, so they are somewhat cold-adapted. In winter, they gather in flocks to feed on patchy seasonal crops. They maintain this pattern in New York. Virtually all of the sightings are between December and May. They feed on a variety of native and ornamental tree fruits and seeds. Many sightings have been on extremely cold winter days. It is possible that in the worst conditions they seek warm, man-made microhabitats, of which there are plenty in urban areas. The flock sighted around Queens over the past several years has 12-17 birds. Reports in 2009 from Nassau County may put the total number of birds as high as 50. Older reports seem to indicate at least that many if not more birds. So while surviving, the population does not appear to be thriving. An interesting point is that some experts believe that the orange and yellow feathering on many of the New York birds, like the one below, is due to inbreeding or an avicultural morph. But the greatest mystery of the Mitred Parakeets of New York is where they go during the breeding season, and whether they are breeding. Sightings are virtually unknown from June through November. The birds have never been recorded on breeding bird surveys (or for that matter on any Christmas Bird Count). There is some anecdotal evidence of nests with fledglings from Valley Stream, Nassau (circa 1987), and Cunningham Park, Queens (late 1990s), but otherwise the birds just seem to disappear. So could the population be composed of old birds and/or recently released birds? Are they dying out? It’s possible. But this year I observed a pair copulating in Hillcrest, and in 2009 I observed young birds in the Queens flock, so they probably are breeding somewhere. 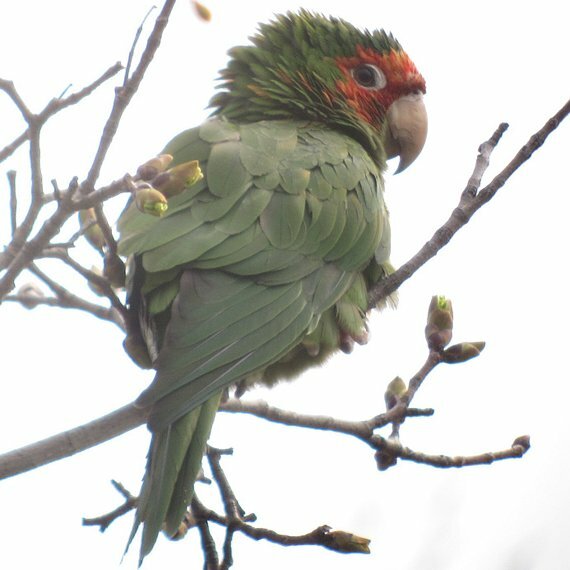 It is quite safe to say, however, that Mitred Parakeet is not a candidate for addition to the New York State Checklist of Birds at this time. To help solve the mysteries, I would appreciate readers contacting me via email at sausubel AT nyc.rr DOT com with any sightings of Mitred Parakeets in the New York City metropolitan area, especially during the summer and fall. Anyone interested in learning more about these colorful and fascinating birds can read my article recently published in The Kingbird. Okay, another thing I’m an outlyer on 😉 … I know psittacine birds are non-native, and they’re noisy and destructive, and don’t ‘belong’ here… in short, I know the rational reasons for opposing their presence… but I love parrots (they’re beautiful and brainy), and the thought of them slowly expanding across parts of the U.S. always puts a smile on my face! I had no idea that there were Mitred Parakeets hanging out in NYC since the early 80s! @ Cyberthrush, the ecological impacts of feral parrot species are often overrated. In New York they’re virtually nil. There had been concern that the birds would be agricultural pests (as some species are in their native lands), but in New York the birds are limited to the urban environment. They also do not compete with native species. So unless you are particularly sensitive to their screeches, it’s not a problem. Even in Florida and California where many non-native parrots are established, their impacts have been few if any. 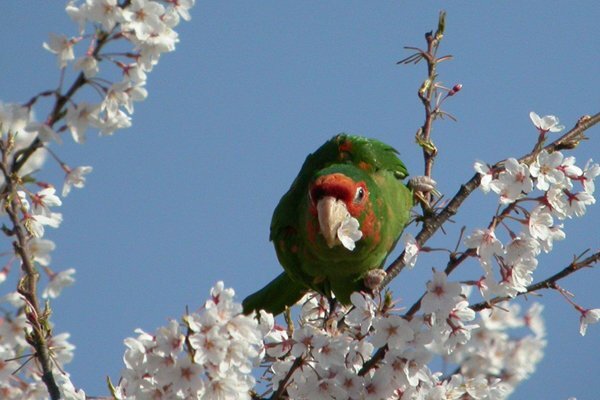 In their native lands, many parrots (including Mitred Parakeets) take advantage of the easy-pickings on farms, but their impacts are miniscule relative to insect pests. So since the “cat is out of the bag”, just enjoy them! I like seeing parrots, even introduced ones, as much as the next birder. But this shouldn’t colour the judgement on the impact of the introductions. And good luck convincing people they should be culled if they get out of hand. I have been blessed with seeing them in my back yard for the last 4 years In Ozone Park. The Day after the Blizzard in Dec 27,2010, I had a flock of over 18 on my back tree. They were stripping clean the dried berrys on its branchs. I dont know how they survive the Winter. But this year my wife and I seem to see them once or twice a week from our kitchen window. I got some new and disturbing information on the Mitred Parakeets of Queens, through a fellow who has been studying urban parrot populations around the world. After reviewing photographs of the Queens birds, he believes the feather discoloration is due to Psittacine Beak and Feather Disease (PBFD), a contagious viral infection that is especially deadly to young birds. Older birds can recover, but become carriers. Feather discoloration is one of the early symptoms of the disease. Some information on the disease is at http://en.wikipedia.org/wiki/Psittacine_beak_and_feather_disease As you can see from the photos, many of the birds are in poor condition. To my own eyes, the birds were in worse condition in 2011 than in prior years. In fact one of my photos not shown above shows a bird with a hole in its beak, one of the later symptoms. Here is a public link to my facebook album of the Mitred Parakeets. The first photo shows the bird with the hole in its beak. Just posted a some pics to my FB profile. Observed a flock of well over 100 (probably around 200, easily) in Las Palmas Park in Sunnyvale, CA in the San Francisco Bay Area. They completely dominate this park. Obviously not the ones you are referring to in New York, but very impressive display today in the park. I know this is an old post, but I was thinking that the parrot’s mis-lcolored feathers could be a result of poor diet. Seeing PBFD mentioned is probably more plausible, given the low genetic diversity. I know Eclectus parrots tends to have discolored feathers sometimes, especially since their diet is so specific. My own conure, on her first molt, had mis-colored feathers due to a switch in diet.